The Best ERP blogs from thousands of top ERP blogs in our index using search and social metrics. Data will be refreshed once a week. ERP newsletter is a comprehensive summary of the day's most important blog posts and news articles from the best ERP websites on the web, and delivered to your email inbox each morning. To subscribe, simply provide us with your email address. London, England About Blog ERP In News ( EIN) is a group of senior ERP professionals who provide a hand curated set of ERP related information to keep the relevant professionals and decision makers updated. Read the blog to find up to date information and the latest trends in cloud ERP software and the internet of things (iot). Facebook fans 223. Twitter followers 8,298. About Blog ERP News is the leading source of technology news and information for IT influencers worldwide. The unbiased online news portal is focused on ERP industry and publishes articles, news, success stories and white papers from all around the world. Facebook fans 99. Twitter followers 901. Indore, India About Blog Read the blog to find articles on Oracle applications, mainly Oracle Financials. Facebook fans n/a. Twitter followers 605. About Blog ERP Cloud experts provide comparisons and opinions to professionals in the ERP software selection process. Facebook fans n/a. Twitter followers 1,452. About Blog Microsoft Dynamics ERP experts provide reviews and opinions to educate professionals in the #ERP selection process. Facebook fans n/a. Twitter followers 5,910. About Blog Enterprise Irregulars is a diverse group of practitioners, consultants, investors, journalists, analysts and full time bloggers who share a common passion – enterprise technology and its application to business in the 21st century. Facebook fans 1,358. Twitter followers 9,100. Denver, Colorado About Blog Panorama Consulting Solutions specializes in enterprise consulting, infrastructure consulting and enterprise resource planning (ERP) consulting for mid- to large-sized, private and public sector organizations across the globe. Visit the Panorama's blog on ERP selection, ERP implementation, business transformation and organizational change management. Facebook fans 607. Twitter followers 5,225. Norfolk-Virginia Beach VA-USA About Blog xTuple's mission is to help companies of all sizes successfully implement powerful, and easy-to-use, open source Enterprise Resource Planning (ERP) software to grow their business profitably. Facebook fans 542. Twitter followers 1,835. South Africa About Blog SMARTER ERP is a blog created by SYSPRO to share the company’s ideas, experience and passion for enterprise resource planning (ERP). SYSPRO is an independent vendor of enterprise business software and services. Backed by a dedicated and professional team, SYSPRO provides world-class software solutions to customers across a broad spectrum of industries. Facebook fans 23,205. Twitter followers 10,062. About Blog Get the latest insights from ERP industry, advices & best practices for SMB, trends, research and how-to's from our expects. All-in-one to empower your enterprise and drive your business forward. Facebook fans 4,305. Twitter followers 23,559. Palo Alto, CA About Blog ERPScan is the most respected and credible Business Application Security provider. ERPScan’s primary mission is to close the gap between technical and business security, and provide solutions to evaluate and secure ERP systems and business-critical applications from both, cyber-attacks as well as internal fraud. Facebook fans 808. Twitter followers 4,129. Chicago, IL About Blog Ultra's ERP software blog covers all aspects of ERP systems and enterprise software, as well as OCM and business process improvement. Facebook fans 206. Twitter followers 1,815. India About Blog BatchMaster India is committed to provide best-in-class ERP software to manufacturing industries. Read the blog to know more about our product and services. Facebook fans 6,627. Twitter followers 11,125. Corporate HQ: Paso Robles, CA About Blog IQMS has been offering Manufacturing Software and ERP Software systems for repetitive, process and discrete manufacturing industries since 1989. The mission is to provide innovative ERP software to the manufacturing industry with the goal of increasing communication across their entire supply chain. Facebook fans 763. Twitter followers 1,441. Vaughan, Ontario About Blog Visit the Blue Link's blog to get the latest industry trends, tips & tricks on inventory management & accounting ERP software for wholesale & distribution. Facebook fans 179. Twitter followers 738. Boston, Mass. About Blog CIO.com delivers the latest tech news, analysis, how-to, blogs, and video for IT professionals. Find useful ERP articles. Facebook fans 58,208. Twitter followers 178,805. San Jose, CA About Blog Read about emerging trends and best practices in ERP, financial management, and accounting software. Facebook fans 5,637. Twitter followers 9,322. Austin, TX About Blog Epicor business management and ERP solutions are designed to meet the needs of your industry. ERP experts share their thoughts on enterprise resource planning with customers, partners, and prospects like you. Facebook fans 23,493. Twitter followers 8,099. About Blog APPSeCONNECT is a hybrid integration platform, providing comprehensive integration solution to make businesses more productive and profitable. Read the ERP blog to find useful articles. Facebook fans 6,956. Twitter followers 1,174. Santa Barbara, CA About Blog QAD is a leading provider of manufacturing ERP software in the cloud and on premise. At QAD, we have imagined this, and are committed to helping you achieve this vision for the future that we call ‘The Effective Enterprise’. Facebook fans 2,198. Twitter followers 3,018. Riyadh, Saudi Arabia About Blog SolutionDots Systems allows managing the business as well as customer financial records with account management software. It is a customer account management software to extend collaboration. Facebook fans 1,020. Twitter followers 381. About Blog Networkers’ is a market leading global recruitment consultancy, specialising in the delivery of bespoke recruitment solutions to some of the world’s leading organisations. Here you’ll find news, market insights and career advice relevant to ERP. Facebook fans 1,966. Twitter followers 2,593. India About Blog Greytrix is one of the largest Gold Development Partner of Sage product lines and have been awarded "Sage Partner of the Year" multiple times. In this blog, Greytrix will endeavor to share its knowledge with regards to implementation, training, customization, components and technology and help users to understand in depth techno – functional aspects of Sage X3 ERP. Facebook fans 325. Twitter followers 2,564. Bangladesh About Blog WP ERP is a revolutionary web-based ERP solution by weDevs. It can handle all business related tasks like HR, CRM, Project Management, Accounting and other departments which are needed to run and coordinate an entire business structure – small or large. Facebook fans 5,036. Twitter followers 77. Riyadh, Saudi Arabia About Blog SolutionDots has a new approach to designing, building and using business managing software or ERP systems. SolutionDots offer most Reliable cloud ERP Software & Accounting Solutions for Small and medium-sized enterprises. Facebook fans 916. Twitter followers 391. Vietnam About Blog TRG is a market-leading global professional services firm focusing on delivering technical excellence. TRG adds value in a challenging and dynamic market by delivering the right IT solutions that work quietly and brilliantly in the background, freeing customers up to focus on their core. Facebook fans 3,755. Twitter followers 7,296. Milwaukee, WI About Blog WorkWise is a leading developer of Enterprise Resource Planning (ERP) and Customer Relationship Management (CRM) software solutions along with comprehensive implementation and support services. Facebook fans 1,261. Twitter followers 233. United States About Blog Bista Solutions Inc. is a world-class software development company providing ingenious custom software solutions to a wide range of enterprises. Our expertise in customized ERP development, developing Enterprise-grade business applications and customer-focused service has helped numerous businesses by saving their time, reduce costs/wastage, and ultimately increasing business efficiency. Facebook fans 1,125. Twitter followers 759. USA, UK, EMEA, APAC, ANZ About Blog Washington Frank is a trusted recruitment partner that has built a strong track record of delivering permanent and freelance ERP resources into a very diverse range of businesses across the entire ERP project life cycle. It's mission is to be the number one global ERP recruitment agency by placing more professionals with businesses looking for ERP resources than any other organisation. Facebook fans 174. Twitter followers 339. Singapore About Blog HashMicro is a leader in Singapore ERP Solutions company providing a wide range of solutions, ranging from Accounting Systems, Inventory Systems, Human Resource Management, CRM, POS, School Systems, Booking Systems and many more. Facebook fans 1,044. Twitter followers 16. Mount Prospect, IL About Blog Crestwood Associates is a Microsoft Gold Certified professional services consulting firm delivering smart solutions to small and middle market organizations. We provide personalized ERP solutions that help you meet important business goals. Facebook fans 972. Twitter followers 1,105. San Antonio, Texas About Blog Check out the ERP Accounting Software Blog to stay on top of all things ERP, accounting software, business software, and more. Facebook fans 122. Twitter followers 160. Dallas, TX About Blog BTerrell Group blog for CFOs and Controllers regarding current events, topics and issues related to ERP, accounting, financial, CRM and HRMS systems and solutions. Facebook fans 27. Twitter followers 504. San Ramon, CA About Blog Rootstock is a robust end-to-end Cloud ERP system 100% native to Salesforce. Rootstock's enterprise resource planning solution elevates operational performance and controls costs for mid-market to large manufacturers, distributors and supply chains. Facebook fans 12,441. Twitter followers 22,848. The Woodlands, Texas About Blog Read our ERP software blog for the latest industry news and articles focused on ERP software and the manufacturing industry. Facebook fans 2,364. Twitter followers 744. St Louis, Missouri About Blog Datix has been designing enterprise software solutions for almost 20 years. Datix is a software solutions provider that helps businesses reach their full operating potential. Facebook fans 155. Twitter followers 2,423. San Mateo, CA About Blog Exact MAX is ERP software built to help small and mid-sized manufacturers make a big impact. Read the blog to find insights, opinions and news relating to the world of manufacturing and ERP software. Facebook fans 165. Twitter followers 228. Pleasanton, CA About Blog SmartERP is a unique organization in the Enterprise Business Applications space providing innovative, cost-effective and configurable solutions and services for common business problems. Facebook fans 240. Twitter followers 488. Vancouver, BC About Blog Catapult brings businesses in Canada and the US our blog providing valuable news, tips, and insights on ERP and CRM. Facebook fans 28. Twitter followers 1,168. Cincinnati, OH About Blog ERP Suites, a trusted Oracle and Microsoft partner, provides comprehensive technology solutions to match your business requirements. ERP Suites provides premium managed services for a vast array of clients from a variety of industries. Facebook fans 39. Twitter followers 295. Carmel, Indiana About Blog Blue Horseshoe is a privately held solution services firm based in North America; providing expert management & strategy consulting, system design, implementation, optimization and distribution design services to Fortune 500 and mid-market businesses throughout the world. Facebook fans 315. Twitter followers 1,174. Toledo, Ohio About Blog Founded in Toledo, Ohio in 1990, Technology Group International (TGI) is an ERP vendor specializing in the development, sale, implementation, and support of Enterprise 21 ERP, TGI’s fully-integrated ERP system for small and mid-market manufacturing and distribution companies. Facebook fans 37. Twitter followers 574. Dublin & Belfast, Ireland About Blog Based in Dublin in Ireland & Belfast in Northern Ireland, Sysco Software deliver world class business solutions built on Microsoft Dynamics ERP and CRM. Facebook fans 17. Twitter followers 219. San Diego About Blog Read the blog to get the latest update in Enterprise Resource Planning (ERP) system articles & software news. Facebook fans 51. Twitter followers 316. 4238 Lozells Ave, Burnaby, BC About Blog Binary Stream Software is a leading ERP solution provider, developing fully integrated software solutions for Microsoft Dynamics GP and AX. Read about what's new and upcoming with Binary Stream. Get the latest information on Microsoft Dynamics GP and AX. Facebook fans 177. Twitter followers 4,347. Minneapolis About Blog Get Microsoft Dynamics ERP product tips and tricks, and the latest updates from Boyer & Associates. Facebook fans 68. Twitter followers 433. Mission Viejo, CA About Blog ERPVAR is an online resource dedicated to ERP software customers like you who are seeking to enhance or replace their current ERP software. Explore our ERP software developer enhancements to save time and money. Facebook fans 39. Twitter followers 1,125. Chennai, India About Blog Kaar Technologies is a one-stop-shop for full range of SAP services and solutions with special focus on SAP Cloud Products. Kaar with its strong SAP practice provides services in the areas of SAP ERP implementation, enhancement, application development, integration, upgrade, migration and support. Facebook fans 2,132. Twitter followers 655. Chesterbrook, PA About Blog Find tips, insights, and news from the artisans of ERP software. Facebook fans 130. Twitter followers 1,052. Edison, New Jersey About Blog SBS Group is a national Microsoft Master VAR (Value Added Reseller) and Gold Certified Partner. SBS Group provides business management solutions to help growing companies meet their operational, financial, regulatory, and technical challenges. Facebook fans 229. Twitter followers 1,361. St. Cloud, MN About Blog ProcessPro Premier ERP Software provides process manufacturing solutions designed specifically for batch process manufacturing industries. UK, Ireland, Europe, US About Blog Lumenia is a boutique management consulting organisation, specialising in the development of business systems strategy and the selection and implementation of enterprise applications – particularly ERP and CRM systems. Facebook fans 110. Twitter followers 345. Laguna Hills, CA About Blog The OptiProERP blog delivers breaking news, opinion, facts and information about the manufacturing industry. Facebook fans 23. Twitter followers 47. Birmingham UK About Blog CPiO is a Strategic Business Partner of Sage UK, specialising in Sage 200, Sage ERP X3, Sage ERP 1000, Sage CRM Software, Qlik and Infor CRM. Browse our news feed for all of the latest information and updates from CPiO. Facebook fans 97. Twitter followers 877. About Blog Scipio ERP is a powerful toolset for all business needs. Scipio ERP offers a highly scalable, clustering platform for your E-Commerce processes. USA & Canada About Blog Synergy Resources offers specific VISUAL ERP solutions to manufacturing companies. It also provides extensive strategic services and Lean Six Sigma methodology to improve business performance. Facebook fans 229. Twitter followers 424. St. Louis, MO About Blog Microsoft Dynamics GP and Microsoft Dynamics CRM expert blog for professionals in the ERP or CRM software discovery/selection process. Facebook fans n/a. Twitter followers 840. About Blog As a certified Sage & Acumatica reseller, our solutions are powerful, flexible, and backed by over 20 years of industry experience. We offer innovative, modern solutions designed to accelerate your business and effectively solve your industry-specific and operational challenges. Our goal is to make companies more successful through strategic consulting services, innovative solutions. United Kingdom About Blog Microsoft Dynamics ERP covers all business functions streamlining your finances, sales, and operations into one ERP solution. Prodware can help you find the ERP solution that best suits your business needs with Microsoft Dynamics NAV and Microsoft Dynamics AX. Facebook fans 1,959. Twitter followers 611. Green Bay, WI About Blog The Lake Companies is a Midwest provider of enterprise resource planning (ERP) business software solutions. No matter what your current size, if your organization wants to become a big success, without the headaches, hassles, excessive time and costs it often takes to get there, The Lake Companies can help. Facebook fans 28. Twitter followers n/a. Australia and New Zealand About Blog JCurve Solutions is your trusted cloud technology company helping you with ERP and TEMS cloud solutions. Get the latest ideas, tips and info on business strategies, processes and leveraging ERP to grow. Facebook fans 563. Twitter followers 3,164. About Blog In2grate Business Solutions specialises in ERP for manufacturing software. Facebook fans 85. Twitter followers 87. Renton, WA About Blog Read our blog to learn about Microsoft Dynamics GP ERP, Intacct cloud accounting and business intelligence (BI) software. Facebook fans n/a. Twitter followers 835. Headquartered in Charlotte, NC About Blog InterDyn Artis is your one stop shop for Microsoft Dynamics ERP, CRM and business productivity solutions. Facebook fans 10. Twitter followers 946. Edmonton, Alberta About Blog Reflex is an industry leading, all-in-one ERP software solution that offers a revolutionary approach to business management. Facebook fans 30. Twitter followers 571. Portland, OR About Blog VersAccounts is a cloud ERP system designed for fast growing businesses, between $1-$50M in annual revenue, looking to upgrade business management solutions they currently have including entry-level accounting products or mid-tier legacy on-premise ERP systems. Facebook fans 44. Twitter followers 298. Atlanta, GA About Blog Adeaca is a specialized Microsoft industry partner, focused primarily on the research and development of new business processes and ERP software for project-based companies. Facebook fans 23. Twitter followers 18. Arlington, TX About Blog Clients First Business Solutions of Texas, located in the heart of the Dallas, Fort Worth Metroplex, is in the business of helping small to medium sized enterprises implement the best ERP software to assist in all areas of their organization. As a Microsoft Gold ERP Partner, our senior team has over 20 years of experience implementing and supporting ERP systems for supply chain enterprises. Facebook fans 160. Twitter followers 1,133. Simi Valley, CA About Blog Arxis Technology is a Sage Intacct Premier Partner and Adaptive Insights-certified Partner with offices across the country. Read the blog to find ERP software technology tips. Facebook fans 9. Twitter followers 119. Austin About Blog Mindover Software is a business software reseller which offers a broad range of accounting, ERP and CRM software including Acumatica, Sage 100, Sage 300 and Sage CRM. Read the blog to find useful ERP articles for your business. Facebook fans 16. Twitter followers 383. About Blog EMatters a blog by Joshua Greenbaum of Enterprise Applications Consulting, takes the customer’s point of view on topics related to business, technology and strategic go-to-market activities around the total enterprise software experience. Facebook fans n/a. Twitter followers 2,626. About Blog Lakeview's blog covering topics relating to ERP and Cloud solutions across multiple industries. Since its foundation in 1986 Lakeview has provided ERP software designed to support our clients requirements in the food & beverage, wholesale & distribution and manufacturing sectors. Facebook fans 16. Twitter followers 866. US & Canada About Blog We are the leading developer of enterprise resource planning (ERP) manufacturing software specifically designed for small to medium-size custom manufacturers, known across North America for our industry-expertise and service excellence. Stay up to date with topics on ERP manufacturing software and industry-related news. Facebook fans 253. Twitter followers 539. Michigan About Blog The TM Group, Inc. founded in 1984, is a nationally acclaimed Microsoft ERP and CRM Gold partner with core expertise in Microsoft Dynamics and NetSuite. The TM Group blog featuring news & insight about business software solutions such as Microsoft Dynamics CRM, GP, NAV & NetSuite Cloud solutions. Facebook fans 128. Twitter followers 724. Indianapolis, IN About Blog Accent Software is a Microsoft Business Solutions Partner located in Indianapolis, Indiana. The mission is to assist companies gain better control, increase margins, and improve profitability of their business by utilizing the latest technology and business management software. Facebook fans 38. Twitter followers 641. About Blog A blog about ERP, Business Planning and Management focused on managing Profit and Loss. This blog will examine all things related to managing your business and how an ERP fits into those needs. Raleigh, NC About Blog Accounting and ERP Consultants. Massey Consulting is an accounting software NC based organization for ERP solutions from Sage Intacct and Microsoft Dynamics across the US and Canada. Facebook fans 124. Twitter followers 857. Australia About Blog Axsys is one of the largest sales and service partners of MYOB Enterprise solutions in Australia. In the ERP blog you will find product reviews, in-depth discussion papers, topical discussions, reviews and tips. Facebook fans 136. Twitter followers 129. USA and Canada About Blog For 30 years, MIS has helped businesses throughout the United States, Canada, and Mexico cut through the marketing hype to identify the ERP solutions that best meet their needs. Visit the blog to find articles that will help your businesses achieve optimum performance. Facebook fans 13. Twitter followers 518. About Blog Encompass is a certified Platinum Partner of Epicor, an industry-leading developer of mission-critical enterprise ERP applications and ERP consulting. Founded in 2001, Encompass Solutions, Inc. is a professional services organization that includes deeply experienced, senior consultants who provide expertise in ERP and related business application systems. Facebook fans 50. Twitter followers n/a. Orange County, CA About Blog For 30 years, Collins Computing has been selling and supporting accounting software solutions. We're experts in Microsoft Dynamics GP and Acumatica Cloud ERP. Facebook fans 68. Twitter followers 386. About Blog InOrder is a real-time, tightly-integrated, end-to-end ERP system. InOrder is the end-to-end ERP solution that serves as one central system to manage everything from eCommerce, customer response, campaign & list management, personalization, order, inventory & warehouse management, accounting, and reporting. Facebook fans 32. Twitter followers n/a. Germany About Blog GWS is a company of the company group Fiducia & GAD IT AG and develops ERP systems based on Microsoft Dynamics. The company provides innovative merchandise management systems and collaborative solutions based on Microsoft Dynamics for retail and service companies. Facebook fans 209. Twitter followers 119. Reigate About Blog Clear ERP, a NetSuite Solution Provider, was founded by Julian Griffiths, in 2014 to work with ambitious, growing companies, helping them to select and implement the World’s leading cloud based ERP Solution, NetSuite. Facebook fans 42. Twitter followers 432. Kanjur Marg, Mumbai About Blog StrategicERP from ITAakash Strategic Software (P) Ltd is software platform for Start-to-end process automation, information management system customized for Real Estate,Construction & Infrastructure Industry. Facebook fans 2,662. Twitter followers 176. Indiana, USA About Blog Secure ERP is a network cybersecurity, business continuity, HIPAA compliance, & ERP Implementation adviser in Indianapolis with over 25 years of experience supporting small to medium sized businesses in Indianapolis and throughout central Indiana. Facebook fans n/a. Twitter followers 260. About Blog This blog is on Sage Accpac ERP and Sage CRM solution in particular and other ERP and ICT information. Facebook fans 252. Twitter followers n/a. About Blog Back to Basics was incorporated in Ontario Canada in 1998. Kim Worrall is a CPA, CA with over 30 years of business consulting and financial management experience. Kim’s love of numbers has made her the go to person for solving complex issues within Infor Visual ERP. India About Blog An ERP Blog from India dedicated to ERP Implementation, Upgrade and Consulting. About - ERP In News ( EIN) is a group of senior ERP professionals who provide a hand curated set of ERP related information to keep the relevant professionals and decision makers updated. Read the blog to find up to date information and the latest trends in cloud ERP software and the internet of things (iot). About - Oakley delivers innovative technology solutions that improve the performance and efficiency of companies across the world. Our team of UK developers use the latest technologies to create fully integrated solutions. About - CPiO is a Strategic Business Partner of Sage UK, specialising in Sage 200, Sage ERP X3, Sage ERP 1000, Sage CRM Software, Qlik and Infor CRM. Browse our news feed for all of the latest information and updates from CPiO. About - Lakeview's blog covers topics relating to ERP and Cloud solutions across multiple industries. Since its foundation in 1986 Lakeview has provided ERP software designed to support our clients requirements in the food & beverage, wholesale & distribution and manufacturing sectors. 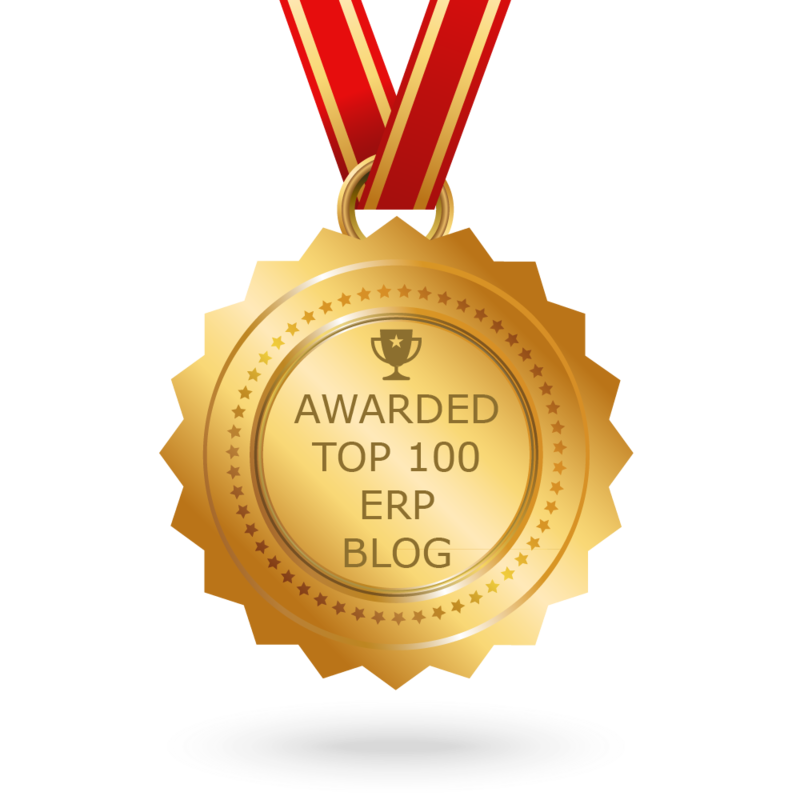 CONGRATULATIONS to every blogger that has made this Top ERP Blogs list! This is the most comprehensive list of best ERP blogs on the internet and I’m honoured to have you as part of this! I personally give you a high-five and want to thank you for your contribution to this world.